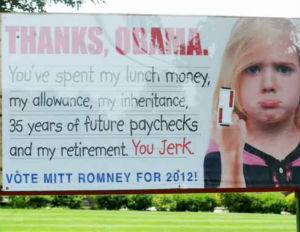 Two anti-Obama signs in Massachusetts are turning heads, but for all the wrong reasons. So much so that local residents have expressed their distaste. One billboard ad depicts a young white girl pouting, while holding her middle finger up with the message, “Thanks, Obama. You spent my lunch money, my allowance, my inheritance, 35 years of future paychecks and my retirement, you jerk.” While the ad clearly points to criticisms of what Republicans characterize as President Barack Obama‘s fiscal recklessness, the pointing of the girl’s finger has become true center of controversy. It was reported that the man responsible for both ads, Robert Sullivan, does not have the proper permits necessary to install the signs.